Let me begin by wishing you all a happy Christmas - I hope you ate lots of turkey, those little sausages with the bacon wrapped round (my favourite) and Xmas pudding! But now, to business. It has slipped under my radar until now, but as well as the drilling sites on the Fylde Peninsular, Cuadrilla are the proud owners of a small gas well at Elswick, a small town on the Fylde. The question is, why? The may be many reasons - for example the sale from Independent, the previous owners, may have included geological or geophysical data that could have been beneficial to Cuadrilla. However, it wouldn't be surprising if, as surmised by Frack-Off, a major element in the sale was the use of Elswick for PR purposes. You can see on the Cuadrilla site a couple of images of the site. The well-head is capped by a 'Christmas tree', about the size of a person. The site can be easily concealed with a medium-sized hedgerow. This is what a shale-gas drilling site will look like once the drilling and fracturing stages are completed (so about 6 months to a year after drilling begins). So owning this site, and having photos to plaster all over the web will provide a useful PR opportunity for Cuadrilla. I did rather enjoy Frack-Off's spectacularly hypocritical article on the Elswick well. It begins with a reasonable enough description of the Elswick site, and Cuadrilla's motives for buying it. However, for Frack-Off, the fact that it is a single well makes the example meaningless, and they end the article with the usually predictable Cuadrilla-bashing. Of course more wells will be needed to produce a shale gas reservoir. Probably one well-head every few miles. What the Elswick example is good for though, is to show what one of these well-heads will look like. Could we handle an Elswick every few miles? The Jonah Field is a tight gas (i.e. sandstone) field developed in the early 1990s. That is before the technology to drill horizontal wells had been developed, so of course there are a lot of wells. Shale gas in the UK would look nothing like the Jonah field. One well head every few miles that looked like Elswick sounds easy enough - but is far from factual. The intent is for 800+ wells and these would be placed on football-pitch sized pieces of land holding 10 wells each. Each well will need to be serviced by in excess of 350 vehicles during its fracking phase. A single vertical well is indeed common - but going down, then horizontal up to two miles and fracking in multiple stages, with wells next to each other (10 per pad) - is completely different and only been in use for 14 years - NO long history of horizontal fracking. Reality is not a Christmas tree every few miles. This piece is talking about the surface impact of fracking beyond the first couple of months of drilling and then fracking. Yes, many truck journeys are required to service a well during these early stages, and that is of course a valid concern where roads are old and small. The pads will initially be football-pitched sized during development, but much of that can be reclaimed once the drilling rigs, pumping trucks etc have gone. But longer term, reality IS a Christmas tree every few miles. OK, perhaps 10 Christmas trees on a single site, rather than one, but the visual impact of that is still pretty small. You seem to be suggesting that there is no difference between a single well pad which has been vertically fracked as at Elswick and a multi-well which would be horizontally fracked? Come on! Please don't be so disingenuous. If nothing else each well multiplies the quantity of flowback water, chemicals, tanker journeys and risk of spillage, well integrity falure etc etc etc. The fact that the bore hole distances are also much longer does exactly the same again. You do your argument no favours by failing to resent the facts properly. If we are talking about duplicity, perhaps we ought to include the fact that Cuadrilla routinely use the image shown on this page of their web site http://www.cuadrillaresources.com/what-we-do/whats-next/ in presentations. Mr Miller stated in a public meeting at St Annes that it shows the Fylde and how it would be if fracking went ahead. His colleagues did exactly the same at meeting for the Conservative Association which I attended at the Hole in One a few weeks before. It doesn't. It shows an area that isn't even in a PEDL, 200 mile away next to the River Severn, and the spacing of the "wells" shown is about 6 miles. To accommodate 80 well pads in the rural Fylde the spacing would need to be a lot more dense than is shown there. I would estimate no more than 2 miles maximum between well pads. I'm sorry, were you accusing somebody of deliberately presenting inaccurate information about what effect fracking might have on the landscape? In this piece I am talking about surface and visual impact, so beyond the longer time on site for a lateral well (or multiple wells), and the extra truck journeys, the longer-term visual impact is pretty similar. I've not looked at that map shot before - any more details about where it is from? I don't think Frack-Off are very honest at all about how they have created the image. All they say is that it is 'from the Jonah gas field'. Any casual reader would draw the sensible conclusion that this would be a shale gas field developed relatively recently. Otherwise what is the point of the comparison? They should add the caveat 'the Jonah Field is a conventional gas field, developed in the early 1990s, using early 1990s drilling technology that did not allow for horizontal wells, meaning that pads are much more closely spaced'. Otherwise, they are being disingenuous. If I had to estimate, going on the Frack-Off picture, the pads look like they are spaced a maximum of 200m apart. If Cuadrilla's 5-6 miles apart is an exaggeration one way, 200m is a vast exaggeration the other. Doesn't look quite as dramatic as the Jonah shot, do they? You do accept, I take it, that Cuadrilla are being at least as "not very honest" as you are accusing Frack-Off of being? As I said - nobody knows how many pads there will be or how dense they will need to be do they? (Other of course than "a lot"). They may well replace rigs with "Christmas trees" but what will your friends do with the access roads, pipelines and power stations. They can't replace them with Christmas trees can they? And they always seem to forget to correlate the fact that any employment will only be around whilst the wells are at their most visually and environmentally intrusive. When your lovely Christmas trees appear the employment goes down to a handful doesn't it? Thanks for helping me find the image. Two minutes on google earth show that the well sites shown on the Cuadrilla map image are about 3 miles apart. You claimed they were 6 miles apart. Why? I agree that it is a little odd that they showed a site in the SW. Perhaps it was lifted from work being done on shale gas in Somerset, I don't know. The point is to show the impact on the countryside, so whether that countryside is the Fylde or elsewhere is a fairly academic point. So, you have Cuadrilla showing 3 mile pad spacing, while Frack-Off show 200m spacing. While we all have to accept that every side in this argument will attempt to slant the discussion in their favour, it's pretty clear who is being disingenuous here. But suddenly the goalposts seem to have shifted. Now you have a problem with pipelines and power stations. You do know that we have a pretty large national grid of gas pipelines already? Good job noone opposed them at the time, otherwise noone would have any central heating. And while no-one could claim to like a power station, we have quite a few of them in the country, and people are pretty happy to be able to get their electricity from them as well. LOL - sorry, they are in fact 3 miles and 5 miles apart - I just measured them using Google's tool. Still, given that Cuadrilla are on record as stating that the well pads they plan "would be no closer than two miles apart, meaning that the impact on the landscape is extremely limited." we are arguing about how dead the corpse is, not whether the accused is guilty here aren't we? In fact they could fit less than 40 pads into the available area of their entire PEDL whilst keeping to their 2 mile rule, if they keep the prescribed distance from inhabited areas. On that basis I would question their assurance on 2 miles as much as I question their use of that image. 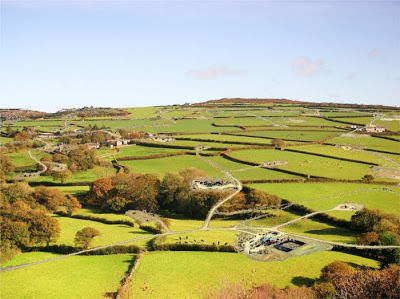 "I agree that it is a little odd that they showed a site in the SW. Perhaps it was lifted from work being done on shale gas in Somerset, I don't know. The point is to show the impact on the countryside, so whether that countryside is the Fylde or elsewhere is a fairly academic point. " So, let me get this right, as a scientist you are saying it's OK for them to claim that a handy picture of some work they are doing somewhere else this *is* the Fylde (as they have done twice in my hearing now). The fact they clearly misled their audience in doing so is just an "academic point" is it? Maybe that's how academic peer-reviewing works down your way but I don't find that very convincing? I think if anyone is being disingenuous now, it's you Doctor. ..and no goal posts are being moved here. I have ALWAYS had a problem not just with the potential for accidents and pollution caused by well integrity failure, but with the impact on the local environment and amenity value that will be suffered regardless of whether it can be done safely or not. I am not stupid enough not to realise that the UK already has some infrastructure, and you presumably are not stupid enough not to realise that the required infrastructure for fracking in the Fylde would turn a previously agricultural area into an industrialised zone. The purpose behind frack-off's image is (I imagine) to demonstrate the type of change we might expect to the Fylde. You may be right and it may be slightly exaggerated. If the rumours of 160 well pads are true though then it certainly isn't. At least they don't claim it is something it isn't. They clearly say "The image was created by overlaying well pads from the Jonah gas field in Wyoming on to an image of some English countryside." If you wish to criticise them for doing that, you must accept that your friends at Cuadrilla are guilty of worse in falsely claiming that a sanitised image of somewhere else is the Fylde, and that the well pad density shown is representative of some future reality. LOL! You've shown that the main basis for your criticism (that Cuadrilla are massively underestimating their well spacings in their publicity) is based entirely on mis-information Whether you did this yourself, or are just parroting the Frack-Off line, I don't know (or care). Yeah. LOL. Meanwhile Frack-Off show a photoshopped image based on obsolete technology for what is not a shale gas field, and you don't have a word of criticism. They do not in any way make this clear, leaving the reader to assume that it's based on modern shale gas development. But, you know, LOL. What are the well spacings used in Pennsylvania and other places. You can get a feel from the aerial images I posted. You don't see the well pads jammed in next to each other like in the Jonah picture. LOL. Whatever number of well pads Cuadrilla have said, it makes no sense for them to be closer than 2 - 3 miles at minimum. As for where the Cuadrilla image is from, the purpose of the image is to give an idea of well spacing. You can't argue that Cuadrilla have done a more honest job of depicting likely well spacing with their image than Cuadrilla have. But, you know, LOL. As for moved goalposts? You might remember this issue started about the visual impacts of drill pads. Once I'd conclusively demonstrated that the Frack-Off image is a load of nonsense and that the Cuadrilla image is far more representative, you suddenly change the subject to pipelines, power plants and job creation. Moved goalposts. LOL. You can try to argue black is white, but you are defending a lie. (The misinformation you speak of comes from Cuadrilla themselves.) That is a bad thing for a scientist of any repute to be seen to be doing isn't it? Yeah. LOL. If you would just open you mind you would realise that the visual impact of fracking is not just about well pads, but about the whole infrastructure that goes with it.Roads, pipes etc Yeah. LOL. PMSL. You can try to limit argument to what you are happy with, but it's not a reasonable way of going about things. Trying to win an argument just to win it rather than taking account of the facts is also not how science gets advanced is it, but I'm beginning to wonder if the truth actually matters to you as much as does trying to score some silly point about the scale on a photoshopped image or trying to justify the lies told by the people you agree with. Yeah. LOL. PMSL. "You can't argue that Cuadrilla have done a more honest job of depicting likely well spacing with their image than Cuadrilla have. But, you know, LOL. " I suppose at least that is true, if a little meaningless. If you took the time to read more of my blog, you might see that I have consistently pointed out that the surface impacts of shale gas infrastructure (and all the truck journeys etc) will probably have more of an impact than anything subsurface, and that surface issues are a far more realistic reason to oppose shale gas development than any scare stories about exploding taps and the like. So I'm not sure what lie you think I'm defending. I do think it's odd that Cuadrilla used an map from Somerset. However, the image does do a reasonable job of highlighting typical well spacing, which was the point of it, right? Following Frack-Off's example, perhaps we can photoshop in a map of the Fylde instead. I do think the scale on a photoshopped image matters (although it's not just the scale, it's that they use an image from the Jonah Field at all). If fracking is as bad as is claimed, they shouldn't have to, they should just be able to get some photos from the USA. It matters not just because I like winning arguments (although I'll admit to being a curmudgeonly bugger in that respect), but because similar images are now regularly used in mass national media, when they do not in any way represent the reality of modern shale gas development. ""You can't argue that Cuadrilla have done a more honest job of depicting likely well spacing with their image than Cuadrilla have. But, you know, LOL. " I suppose at least that is true, if a little meaningless." Yes, it is true. That was the whole point of my original post. I don't think it's meaningless, I think both sides of the argument should be held to an equal standard. I'll be the first to say that Cuadrilla's fumbling attempts at PR have been pretty pathetic (or just plain odd, more often than not, like using a map of Burnham on Sea, why? ), but that doesn't give Frack-Off carte blanche to go making things up, so I will continue to call them on it when they do. Dr JV - I don't have any brief to defend Frack-Off and I would not for a second suggest that they be given carte blanche to say anything they like. Of course they can't. Like you "I think both sides of the argument should be held to an equal standard". To be honest though it does sound a bit pious when you accuse Frack-Off of "spectacular hypocrisy". Minor exaggeration might be closer to the mark, and, unlike Cuadrilla, at least they haven't actually lied about what they are showing. I mean why couldn't Cuadrilla have admitted when asked at their meetings that it was not the Fylde instead of insisting it was? That was such a stupidly unnecessary thing to do - twice! Maybe those concerned genuinely believed it was because they had been misinformed by their own staff - I don't know - maybe they should be given the benefit of the doubt in this case? That still doesn't explain why the density shown is far less than anything we have been led to expect by their own published projections though! So what I am saying is that Cuadrilla seem to have done worse than what you accuse Frack-Off of doing. It would appear that you do admit that to be true, even as you look for reasons to excuse it. I would genuinely prefer that this debate could be had on an honest and scientific basis, with the real issues aired in a sensible way. As it is the media polarise everything into "dash for gas" and "earth quakes", while the real issues (and there are many on both sides) get swept away out of the discussion. The result is that people remain ignorant. You, as a scientist must agree that that is not a good thing. I don't pretend to know everything about shale gas and fracking - how could I? Before June this year I had no idea what fracking was or what it might mean to my home area. Since then I have tried to learn all I can about the possible benefits and the possible downsides, and I remain unconvinced that it is a good thing. The fact that Cuadrilla constantly seem to mislead us worries me greatly as it calls into question the bona fides of the industry as a whole in my eyes. Their summer "newsletter" is another pretty good example, and makes me pretty sure I am right in drawing the conclusions that I do. If they have a good case they can tell me the truth and they would not need to use a PR company to spin me lines like "There is no evidence of aquifer contamination from hydraulic fracturing" and "Cuadrilla's fracturing fluid does not contain hazardous or toxic components". I mean come on - would YOU try to defend either one of those two statements? This is part and parcel of the same issue about honest communication isn't it? I repeat that I agree that "both sides of the argument should be held to an equal standard"
Pretty sure that's not a drilling site. Nice try though. It shows (in timelapse) the full story from pad construction to completed well. Hope you find it useful. LOL - it comes from the set "Wetzel County Gas Drilling: Aerial Tour (Set: 109)" which you pointed me to with this link http://www.flickr.com/photos/skytruth/sets/72157632055783199/with/8203603186/ above. You did realise that I take it? What makes you suggest it's not a drilling site now, when you yourself pointed me towards it and it is clearly from a set entitled "Gas Drilling: Aerial Tour"? Oh for pity's sake. Seriously? Yes, I know where you got the image from, and I know the album's title. Doesn't mean that all the images are of drill pads. I know it's not a drilling site because I know what they look like. Clearly you don't, which makes me wonder why I'm discussing shale gas visual impacts with a muppet who doesn't know what a drilling site looks like. LOL Oh for pity's sake Dr JV - does it really matter if the picture is actually of a drill pad or some other excrescence of the fracking process? 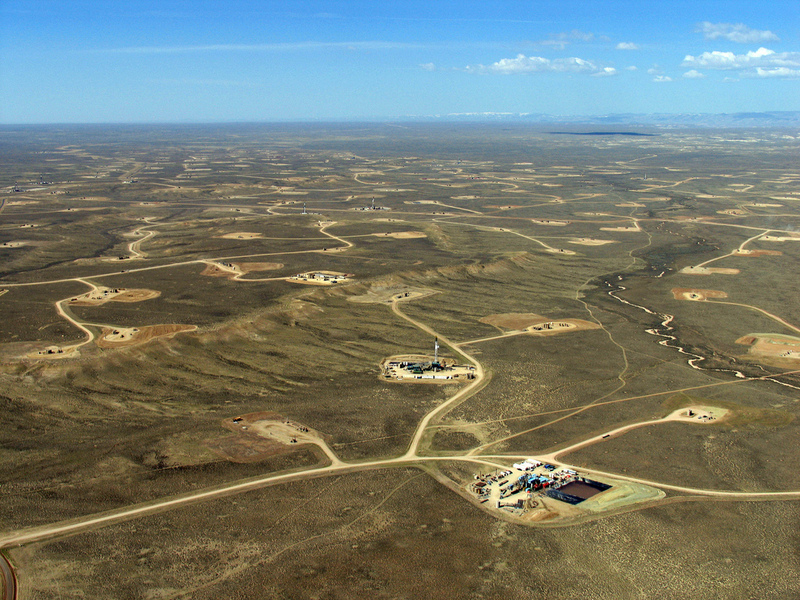 Or are you saying that this picture has nothing to do with fracking? If not what is it then and why is it included in that set Gas Drilling: Aerial Tour"? This ignorant muppet would love to have the benefit of your doctorly knowledge? I have never spoken to anyone at frack-off. I don't need to. I have a mind of my own and it doesn't find you very convincing here. I wouldn't claim to know why it's included. You'd have to ask whoever took them (I don't even know if the taker is in favour of or against shale gas). It might be a power plant, it might be a gas processing facility, I'm not sure (or it could be something unrelated). If you remember, you brought up this photo to try to discredit the 'football pitch' size analogy. If it is a gas processing facility, do you know how many will be built, or where they will be sited? If not, might your apprehension be a little premature? If I knew whether my apprehension were premature I'd be much happier Dr JV. As you can't tell me we are not going to see this kind of facility on the Fylde, I am reasonably apprehensive that we might see something like this powerplant(?) - they will need some of them - or is it a gas processing facility? (whatever that might mean??). Look - Please don't patronise me and the people who actually live where this will happen by suggesting that all we have to worry about is a few Christmas trees though. You know better than that or if you dn't you damned well should. "There is no evidence of aquifer contamination from hydraulic fracturing" and "Cuadrilla's fracturing fluid does not contain hazardous or toxic components". I'm not sure where it stems from, other than folks opposed to shale gas perpetuating myths just to try and turn others to their cause, but it is wrong to label the hydraulic fracturing fluid as hazardous or toxic. When you look at the composition of the fracturing fluid they've used so far - published on their website and, from what I understand, agreed for use with the Environment Agency - it is just water, polyacrylamide friction reducer, sand and sodium salt. Toxic substances are generally those that are ascribed a LD50 or LC50 (gaseous substances) value. The LD stands for "Lethal Dose". LD50 is the amount of a material, given all at once, which causes the death of 50% of a group of test animals. The LD is one way to measure the short-term poisoning potential (acute toxicity) of a material. In Europe, there's a lot of chemicals legislation that applies but the most relevant are the EU Dangerous Substances and Preparations Directive and the Chemical Labelling and Packaging Regulation. None of the products in the fracturing fluid are assigned an LD50 value. The only chemical additive used (polyacrylamide) is not classified as dangerous in accordance with EU classification rules. Considering the other substances listed on their website, Hydrochloric Acid is not classified as toxic - it is corrosive (ie. will destroy intact skin tissue) at higher concentrations (typically bought in at 28-36% called concentrated or conc. HCl) but, when diluted with water, becomes a skin irritant. At low enough concentrations in water, it poses very little risk of harm. The biocide they mention, in raw form, will probably be classified as toxic or even very toxic considering what they are designed to do. However, hardly any will be used the bit that is will be massively diluted, and so even this wouldn't make the fracturing fluid toxic. So, realistically, by any definition it’s not toxic. I wouldn't want to drink it - but then again, I wouldn't scoop a beaker out of any UK river and drink that either! In this whole debate about shale gas exploration, the real arguments seem to be being drowned-out by these side-show myths. It would be good if everyone, on all sides, dropped the rhetotic and attention-grabbing hyperbole and replaced it with a calm discussion of the facts; but people need to open to hearing and believing those facts. LOL - Of course we don't have any contamination yet because nobody has let them do horizontal fracking so far. Doh! Amazing huh? And this is just what Cuadrilla admit to using (or wanting to use)so far. There are some 500 odd other chemicals which have been used in the USA. You do KNOW that don't you "anonymous"? What a waste of effort that long post of yours was. If you want to pretend HCl is non toxic join your friends at Cuadrilla. Just don't expect the intelligent people to swallow your rubbish. Does anyone else think drinking the neat hydrochloric acid and biocide they will have to transport by the tanker to the fracking sites is just like "river water" as well? I doubt it. LOL! Of course by the time they've finished fracking the river water in the area may be polluted so he/she may have a point but that won't be funny will it? Interestingly, again the pro-frackers try to divert the argument to imply that one point is the main focus. The slick-water isn't the main issue and don't pretend I said it was. All I said was that Cuadrilla have misled us in telling us that two substances that are defined as hazardous are not toxic. Of course if you dilute anything enough it becomes non toxic, but would you claim arsenic or strychnine were non toxic on that basis? Not unless you were a total idiot. The same is true of hydrochloric acid and biocide. Its not difficult unless you are hard of thinking. John, what a shame you can't accept the arguments of someone who knows their stuff far more than you do. I wouldnt dream of trying to disparage your knowledge of ... "Retail Merchandise Planning, Open to Buy Planning, Weekly Sales, Stock & Intake Planning (WSSI), Range Planning, Assortment Planning Channel Planning, Financial Budgeting, and Merchandise Planning Training." I see no reason why you should feel able to openly challenge mine - I've forgotten more about industrial chemicals, chemical safety, transport safety and environmental chemcical control since I started this reply than you'll ever know! TRY accepting for once that professionals in other sectors, with their specialist knowledge, are better placed than you to comment on subjects like this. Oh, and concerning HCl - it's corrosive not toxic. Like I said in my previous post. Perhaps you ought to brush-up on your chemistry before trying to rubbish the expert views of others? Or are you simply using the label 'toxic' interchangeably for any substance that's harmful in some way? Do your research and you'll find HCl used in all manner of day-to-day products that we all take for granted, including household chemicals and toiletries. As for your US analogue of 500 chemicals (yes, I've heard that said) it is of no relevance to UK operations. In this country, any firm wanting to introduce materials into the ground have to declare the substances to the regulatory authorities - as I believe has happened. It's unavoidable and legislated for here, unlike there. So the substances declared on the Cuadrilla website are the only ones they've used so far. Even the Environment Agency has openly said so on its' website. To make the leap that so many chemicals will be used in hydraulic fracturing here is frankly ludicrous - apart from the regulatory burden in the UK, these drilling firms will want to avoid using chemicals because of the cost. Retail merchandise planning eh? do tell me more? "Oh, and concerning HCl - it's corrosive not toxic." Obviously the HPA (but not you) subscribe to the generally held understanding that toxic means "poisonous" or "very bad, unpleasant, or harmful" Nice to see the frackers trying to wriggle out of trouble by trying to narrow definitions yet again.Hey ho! And not the Hcl is used in toothpaste thing again? Yawn - we've done that one and nobody is taken in any more. Contact lens fluid, yada yada. Sadly your human mind appears to be cliche ridden Anonymous. Stop letting others do your thinking for you and open you own mind. Ask yourself if there is any necessary logic to the statement that "because something (like using other chemicals) hasn't happened yet it won't happen in future" - that's the fallacy of induction - bad science. If we want to test whether HCL is "toxic" perhaps you'd like to film yourself swallowing a beaker full of HCl in the concentration at which it is transported and post a You tube link. I'll look forward to seeing it. We can discuss whether it's toxic afterwards eh? Oh John, you've argued your point so eloquently I only need point out that, whilst most definitely toxic, Hydrogen Chloride is of course a gas. Cuadrilla do not list this as a substance they MIGHT use, they instead list the liquid Hydrochloric Acid which you'll find is corrosive and not toxic. Of course, I wouldn't take up your childish and futile (and, I note used before so now quite tiresome) challenge of drinking a cup of HCl - but that's not because it's toxic but because of the damage its corrosivity would do to my internal soft tissue. Stick to making good arguments like your piece on economic benefit - and steer clear of the technical stuff that you really don't understand... something you make very obvious by constantly meandering away from the main point you start with (as in this case, firstly claiming the fracturing fluid is toxic, then focussing on HCl and then arching away again to rope in Hydrogen Chloride). So let's get back to the point at which you came in - the statement "Cuadrilla's fracturing fluid does not contain hazardous or toxic components"
Now you have clearly agreed that two of the components listed on their web site - i.e Hydrocholoric Acid and Biocide are hazardous, even if you are trying to be clever about a narrow the definition word "toxic". Personally I don't give a rat's arse whether you are the world's most eminent scientist, you are clearly trying to muddy the waters by diverting the argument and it's not really working is it. I mean I take it you aren't going to start arguing that there's some special definition of the word "hazardous" that is above we mere mortals now are you? It's not worked though I'm afraid, and I repeat, if anyone should be being accused of blatant hypocrisy it's a business that deliberately misleads people at the same time as whining about not being able to have a proper dialogue with the community. My intervention, John, is about calling you on your continuing insistence that the hydraulic fracturing fluid used so far is hazardous or toxic. For the avoidance of any doubt, I'll state again as emphatically as I can: water, sand, polyacrylamide and sodium salt in this formulation are neither hazardous nor toxic. Yes, the other substances listed on the Cuadtilla website are harmful (HCl corrosive, biocide probably toxic) in their neat state. However, once formulated into the fracturing fluid, their presence would not render the fluid hazardous or toxic by any recognised scientific or legislative definition. For the hard of thinking like my Anonymous friend here, I am not claiming and have not claimed that the fracking fluid used by Cuadrilla (so far) is hazardous or toxic. I have even repeated this saying "The slick-water isn't the main issue and don't pretend I said it was" - but he doesn't want to hear this as he is trying desperately to pretend I am saying something else. LOL. My point is quite simply that Cuadrilla have misled us in telling us Cuadrilla's fracturing fluid does not contain hazardous or toxic components" when two substances that they list as components on their own website are defined as hazardous. End of. I hardly think that some wording on their website (that admittedly could be better) constitutes a deliberate effort to mislead the people of the Fylde John. I think you're taking it out of context, the intent was clearly to demonstrate that the fluid used thus far is accurately described as non-hazardous and non-toxic. There's no obvious conspiracy. You're giving them a hard time for being open and disclosing the substances they use, or MAY use, which should actually be welcomed...make your mind up about what's important to you; you can't demand openness then criticise when you get it ! If that were the only similar instance I'd maybe agree Anonymous - I'm afraid it's looks like a symptom of something more systemic though. If they would just communicate with us directly rather than via an expensive PR agency who specialise in "the tougher areas of communication" and are alleged to have a modus operandi which isn't to my taste (http://www.powerbase.info/index.php/PPS_Group ) I'd be more inclined to cut them some slack. You can't pay a fortune to expensive PR agents, make inaccurate statements to reassure local opinion and when caught out say "oh we're just good ol' boys who are not very good with words". Apart from anything else they've been made aware of this error on their website and have chosen not to correct it, so you can hardly say it's not deliberate. Maybe I'm paranoid or maybe I'm just healthily cynical. Now, that I accept. Sadly, with anything like this, operators - good ones, with good intentions - end up being caught between a rock and a hard place; they want to communicate openly, but often get attacked every time they do. In the end, they hunker down and a battle mentality emerges (on both sides). Ironically, question too aggressively and show no sign of being able to accept what they say, and you engineer a situation where you then find out even less and the operator begins to look sneaky and secretive - when that's not usually what they want at all - I've seen it loads of times, and it's why I get frustrated when I see people regurgitate half-truths (and sometimes downright lies) because all it results in is the people who should know (ie. potentially affected populations) finding out less. There's nothing wrong with healthy scepticism, just be prepared to be convinced occasionally! Happy New Year to you too John. I did reply but it seems the reply (anodyne though it was) seems to have been deleted. Pity. That's a shame, I was rather hoping for some New Year cheer John! Perhaps you could re-post? PS Mr /MS Anonymous can I just point out that your argument is predicated on the non-toxicity of components when they are diluted 200 times, while Cuadrilla actually state "Cuadrilla's fracturing fluid does not contain hazardous or toxic components". No John, that's not what I said at all. I said that the water, sand, polyacrylamide and salt used for far are all non-toxic regardless of dilution. You've either misread or are attempting to deliberately twist my comment to suit your argument by taking my comments on HCl and biocide totally out of context. But then, that's your MO isn't it John - can't string a coherent argument together (because you don't really understand the technicalities of the topic) so you resort to this sort of irrelevant ranting. "Considering the other substances listed on their website, Hydrochloric Acid is not classified as toxic .... At low enough concentrations in water, it poses very little risk of harm. So, realistically, by any definition it’s not toxic." Read what you said again yourself - You clearly state there that these things are non-toxic , and give the reasoning that they are massively diluted. We non-scientists describe that sort of thinking as "b*ll*cks"
Now now guys, do be nice please. Anonymous, you may be right with the technical definitions of 'toxic' or 'hazardous', but I think in reality we should be designing wells to ensure that no contamination whatsoever from fracking fluids. Were I a local resident, that is what I'd want, even if the fluids are, from a technical definition, only an irritant, rather than toxic. However, I'm not sure how widely this is being used at present. As regards the issue of contamination, the EPA have not found any incidences of aquifer contamination by fracking fluids. There have been a handful of methane contamination incidences (Dimock being the most well known). Methane is light (and therefore buoyant) and mobile, so if there are wellbore integrity issues, it's more likely to find a way through. The frack fluids, however, are as dense as any formation brines, so there's no driving force to move the fluids into higher formations. The analogy would be getting a mountain stream to flow 2km back upstream. I agree with your logic Doc, but that's not what John says - he says the fracturing fluid is toxic and it's not. Nor are any of the constituents used thus far. His point would be better made if he stuck to the facts and said he was concerned about the potential for contaminating groundwater with any substance that wouldn't normally be there - but, alas, he doesn't because he knows that's a less emotive way of putting it. However, it's a moot point in any case - in the Cuadrilla PEDL area, the aquifer is saline where drilling is taking place and not used for drinking water abstraction. That's not a reason to relax controls, but it's a point that needs remembering. John certainly doesn't rely on a private drinking water well on his property either, and will receive his water supply through the network of public utility pipes...how he expects migrating fluid to get from deep underground and then into those pipes is a mystery - perhaps he can explain the technicalities to us? Or maybe, like others, he relies too much on the US experience where things are very different? Regarding US aquifer contamination with methane, do we know if this was biogenic or thermogenic (and therefore definitely linked to shale gas extraction)? Only, from what I've read, it appears that biogenic methane is commonly found in drinking water aquifers in that area and that homes supplied from wells supplied by the aquifers are routinely fitted with separators to remove the gas....Is there any conclusive proof (ie. isotopic analysis) that absolutely links the Dimmock methane to shale gas? Or are we just relying on Josh Fox and his Gasland frackumentary? The Dimock example was methane from a well. The DEP found that several Cabot wells had been poorly constructed, allowing leakage along the well annulus. This was in 2009. The wells have now been either fixed or plugged, and now the aquifer is back below all environmental minima. Obviously the fact that this happened at all is very disappointing. However, there are a number of lessons that can be taken. Firstly, while methane leaked from a failed well bore, fracking fluid didn't (DEP found no evidence for any fracking-related chemicals in the aquifer). Secondly, it is possible to fix wells with integrity issues - it's not a permanent, unfixable problem. Finally, even though the aquifer was contaminated with methane, once the problem was fixed, contamination levels have return back below environmental minima. "A limited number of chemicals have been approved for use by Cuadrilla so far (none of which are hazardous in the form in which they are used). Listed online, they are: polyacrylamide friction reducer (0.075%), hydrochloric acid (0.125%), and biocide (0.005%)." So, are you now prepared to accept you're wrong and concede that I (and others) more qualified than you to make these assessments are correct? "In the UK, fracking companies must obtain permits for the safe disposal of radioactive material. Radioactive waste is not dangerous if properly handled, however, the EA shale risk assessment does list exposure to NORM as a possible risk in shale gas exploration." Again, an acceptance that the presence of NORM, whilst posing a risk, isn't dangerous per se. Are you prepared to accept this point too? Nice double act guys - ever thought of going on the stage :-) Why do I get the feeling you are talking to yourself there Dr? Whoa, little paranoid there John!!! Suggest you check your medication levels ;-) . I've got no idea who Mr/Mrs Anonymous is, and I don't think I know half as much about technical chemical terms as he/she appears to. I'm sorry it seems like a double act to you, but really it's far more than that: whether it's the Royal Society, the Royal Academy of Engineers, the British Geological Society, most professional geologists and engineers see very little problem with shale gas extraction. Hi Doc, thanks for giving John and I an opportunity to debate on some of these issues - I realise we were skirting close to the edge on occasion, but I think we kept it clean and nobody got a bloody nose! I think it's vital that every opportunity to engage and consult on the issues surrounding unconventional fossil fuel extraction is explored one way or another, and feel that experts in their respective fields need to make information available so that potentially affected populations can make up their minds with a balanced viewpoint. Keep up the good work! Whoa, now I'm confused. Are we? Have I been sleep-posting again???? Why on earth do you call it a Christmas tree ! Small point but so are terms like 'collateral damage' and names like 'little boy'. They conceal their true meaning and always begin with language. Because it looks a little like one. About 6 feet high, with arms branching off, 'decorated' with valves, buttons etc. What would you prefer we call them? Please elaborate on what their "true meaning" is.